The growing global community of 3D printing is, in large part, an online discussion. Printmakers and designers around the world share tips and tricks, open source designs, and free advice on various online forums. All3DP publishes a list every month of the 50 coolest things to 3D print. This month, it includes survival whistles, sound amplifiers, and wrenches. 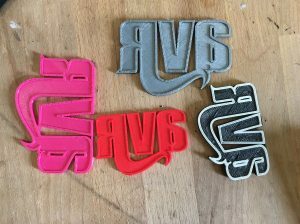 Printing these, as well as pretty much any other object you can think of, is something that Virginia’s first and only 3D print shop, 3D Central, specializes in. Located in Scott’s Addition, 3D Central is a one-stop shop for where the future of the sector is moving. It allows for in-person consultations, assistance, and a physical space for 3D printing. Co-founder Chris Caswell started the store as an Etsy shop in 2011 with his brother, Jonathan, and his wife, Cyndi. “We started the business together when we moved down to Richmond from Boston,” said Chris. As the number of printers and customers grew, they were able to open their own store. The storefront functions more as a workshop than a retail space. Plastic bits litter the surfaces, designs sit beside their physical manifestations, and everywhere you turn is a new small part of a bigger thing. The bits of plastic scattered about are a result of post-print perfection. “The print isn’t done as soon as it comes out,” said Jonathan. During a printing session for RVA Magazine logos, he explained the process through each stage. Computer-aided design (CAD) software is used to model all 3D objects. The precision specifications for printing are laid out in the CAD design: the size, shape, and detail. After the design is created, it is converted into a file format used for 3D printing and rapid prototyping, which takes into account the surfaces of the design. “Everything, everything, is laid out in the software,” said Chris. That file then has to be sliced into layers so the printer can build the model from the bottom up. Since every object is made up of plastic layers, the more layers they use, the more detailed the print becomes. “Then you drag the design to your flash drive and stick it in the printer,” said Jonathan. 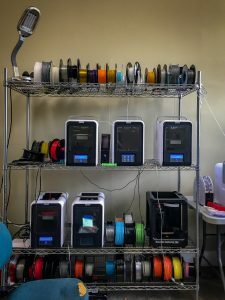 Spools of thick ABS or PLA plastic thread are looped into the machine, determining the type and color of plastic the print will bring to life. Different types of plastic (or sometimes, rubber) work best with different designs. For instance, one customer needed to print a specific screw for his sailboat that he couldn’t find anywhere else. Another asked for custom cookie cutters for her pre-made gingerbread house sets. Another needed to print the prototype for a business model. The Caswells were most excited about a personal printing accomplishment. In one design, they were able to create an accordion-like hinged extension that fans out to almost as wide as Jonathan’s wingspan. It’s the “extendo” in the extendo arm. Like most of their prints, it’s a part, but they haven’t yet attached it to anything. As the technology continues to grow, more opportunities for both commercial and personal use have become available. According to CAD Crowd, MIT has recently developed a 3D printer that outputs almost 10 times faster than the commercial printers currently available — which is leading to breakthroughs in medicine, engineering, and event printed metals. 3D Central taps into these trajectories. In the shop, one could easily spy trade show models, spare technology parts, figurines, custom plastic busts, the Millennium Falcon, and even a shoe. However, one of their more popular products is their Yuni: Single-Sided Stereo Headphone for listeners with hearing problems. The product is 3D printed, assembled, and wired by 3D Central in-house. He said that, besides plastic being a bad material for weapons, for the price of a printer (the cheapest, fully assembled model runs about $600) and the time putting the gun together, one might as well spend the money on a real gun. The debate on 3D printed guns is complicated. Printed guns do not have serial numbers like weapons you’d buy in a store, so they fall under the category of “ghost guns,” which are not legal to buy or sell. What’s more, under the stipulations set forward by the Undetectable Firearms Act, guns have to have metal parts, regardless of whether those parts are necessary for the production, so that they’ll show up in metal detectors. And it is not just a Second Amendment issue: these guns are designed and printed by people, which brings free speech into the debate. Nonetheless, the only weapons 3D Central prints are for cosplay. A pile of printed Nerf guns and accessories hang out in a corner, along with a Nerf dart shooter; they are bright, bulky, printed, and assembled in-house. The most awesome part: there’s also a sword. A few years ago, this technology seemed esoteric and out of reach. Now public schools, libraries, and universities all have 3D printers available for use. Communities at large and private owners will benefit from 3D printing technology – designs and prints can be finished before an Amazon package would reach your door. Even NASA can now send designs for otherwise-expensive spare parts to be printed at the International Space Station for in-space construction. Universities are also testing the bio-printing of viable 3D cells to end the organ transplant shortage. The future of the technology seems limitless. Right now, though, its real merit is in providing quick, simple solutions — like printing a new phone case, or a Halloween costume prop. The technology is popular with tinkerers and craftspeople, and many of these owners have online businesses for 3D printed gifts or toys, some of which are now popping up on Etsy and Amazon. But despite 3D printing’s increased accessibility, it’s still not an appliance, according to Jonathan. With no simple means to create objects, like pushing a button on a microwave, he likened having a 3D printer at home to owning a woodworking machine. To output a finished product, it requires knowledge of the software and the ability to design each object, as well as time, effort, and a willingness to try again if the first print fails. Unless consumers put serious time into in the 3D printing technology, as artists like Chris and Jonathan have done, it is unlikely that the current technology will be used to its full potential. To learn more about the 3D printing process, you can find Chris and Jonathan on their website and Instagram, and check out their products on Etsy and Amazon. Virginia Commonwealth University School of the Arts Department of Fashion Design and Merchandising presents “Momentum,” to be held at 8:00 p.m. on Thursday, May 10 at the Train Shed at Main Street Station, 1500 East Main Street, Richmond, Va.
Tickets are $100 for front row seating; $75 for second row seating; and $40 for standing. Discounts are available for fashion students and their families. The show will also be livestreamed. 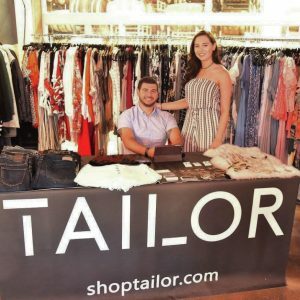 Taylor Pitera, founder and CEO of local e-boutique shoptailor.com, was supposed to be a dentist. “I was actually pre-dental going in to VCU. That’s what I was accepted for,” she said in a recent interview with RVA Mag. However, she quickly realized that cleaning people’s teeth wasn’t for her. Growing up in the Richmond area, Pietra cultivated an eye for couture and style even at a young age. After staring VCU she realized that fashion was her true calling. “I very quickly realized I wanted to do something that I loved and not necessarily where the money was going to be. I sort of figured with passion, that would come,” said Pitera. Pitera enrolled in the VCU School of the Arts, where she would later get a degree in fashion merchandising. Yet before graduating, she knew she needed some experience before jumping directly into the world of fashion, so she picked up a job at Monkee’s of Richmond. During her time there, the store’s largest account, Allie Ro, sent an email looking for fashion interns. “I was graduating in the spring and looking for a change of pace. I said ‘You know what? Why don’t I just apply and see what happens?’”, and ten days after graduating Pitera was on her way to NYC. But sometimes things don’t go according to plan and four days after starting her internship she was given an opportunity to become a sales assistant in the company. Pitera seemed to be on her way: She had obtained a position at a fashion company in NYC, had been promoted, and was only a couple months out of college. Nonetheless, she was commuting two and a half hours every day and the cost of living in NYC was starting to pile up – reality was setting in. Then she came across an article in Women’s Wear Daily and something clicked. Being an independent person from a southern city, Pitera missed the warm hospitality of her roots, and wanted to make her start back in the city she knew best. Pitera could see the way fashion was changing, especially the way clients interacted with fashion companies, so she decided to take her company online. Becoming an e-tailer, or a person who sells clothing and garments via online transactions, seemed like an obvious choice. Pitera’s house also doubles as her business headquarters. While most of her customers come from Richmond, she has received international orders even though she currently only ships in the United States. “I do some styling and do take some client appointments if somebody wants to come over and shop or try things on in person. I have my office set up as an office space, a dressing room, and holds inventory,” said Pitera. Pitera’s e-boutique offers brands such as Elan, Velvet Heart, On the Road, and more. She notes that everything she purchases for her shop is picked by her in person. “I really like to make sure what I’m getting is quality,” she said. “I’m not going to put my name on something that will fall apart or that you’re not going to be happy with.” The lack of overhead makes it easier for her to offer other brands rather than design her own. However, the possibility of offering her own designs is an option for the future. “I’d love to design my own stuff”. Pitera’s taste is reflective of the styles she picks for her clients, which are are trendy, professional, comfortable, stylish, and versatile – everything a fashionable modern woman needs. Pitera says having her business in Richmond is ideal, “Richmond is growing within the fashion industry and growing its own little fashion industry.” Not only is able to tap into fellow entrepreneurs and bloggers to help her with her business, but she draws inspiration from the local fashion scene. “I’m starting to see a lot of younger designers start to emerge,” she said. There is no better tool right now than instagram to give you a sense of what a community is doing. The Amazing Photoshop Skills Of The Henrico PD! In today’s non news, we are in love with this crazy image on the Henrico Police Recruitment page. [Read more…] about The Amazing Photoshop Skills Of The Henrico PD!